For those of you limited by your dorm room, this is the perfect snack recipe. Sweet potato chips require only five ingredients, and with them you can curb that mid-afternoon hunger without feeling the least bit guilty because sweet potatoes are loaded with vitamins B6, C, A, and D. They’re believed to prevent heart attacks, keep skin youthful and elastic and strengthen the immune system. The skin contains most of the fiber and other nutrients, so feel free to leave it on if you don’t mind the taste. These chips can be made with just salt and pepper or you can add cinnamon to sweeten them up. 1. Preheat oven to 400 F. If using a convection toaster, put it on high. 3. Line a baking sheet with tin foil and spray with PAM, or brush with olive oil, to avoid sticking. 4. Lay the slices flat on the tin foil. 5. 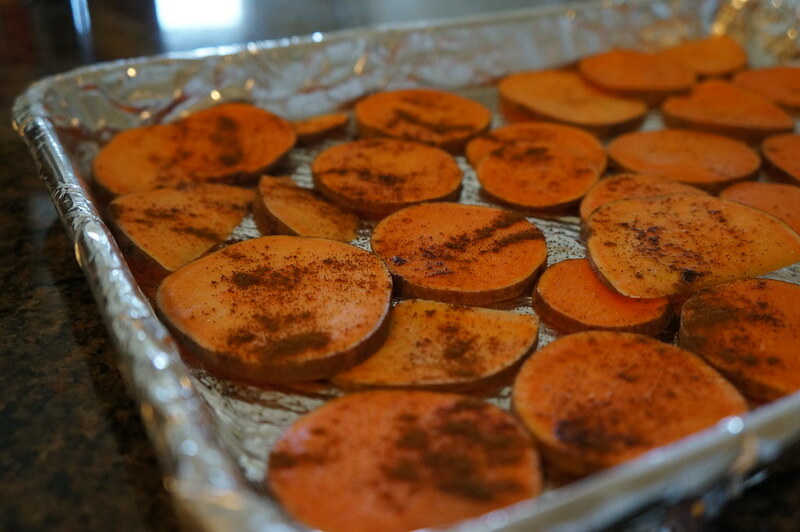 Lightly drizzle the sweet potato slices with olive oil and use a cooking brush to spread (if you don’t have one, use a paper towel) and then sprinkle with salt and pepper or cinnamon to taste. 6. Let bake for about 15-20 minutes, then flip the chips over and season more (if you want to). Let this side bake for another 15-20 minutes depending on how thick you cut your slices. If you used a convection toaster, adjust the time accordingly.